Running a successful online store means investing a good amount of time and effort in engaging your customers through various ecommerce communication channels. To make your brand stand out from the others it is essential that your marketing strategy is focused on keeping your existing as well as new visitors informed and engaged about the latest updates of your business. Unified notification is a handy tool that helps you stay connected with your customers using multiple communications channels. Reports suggest that notification tools like Emails, SMS, Push notifications and web notifications when used in the right combination have a potential to boost customer reach and engagement by 50% to 88% (depending on industry and notification type). 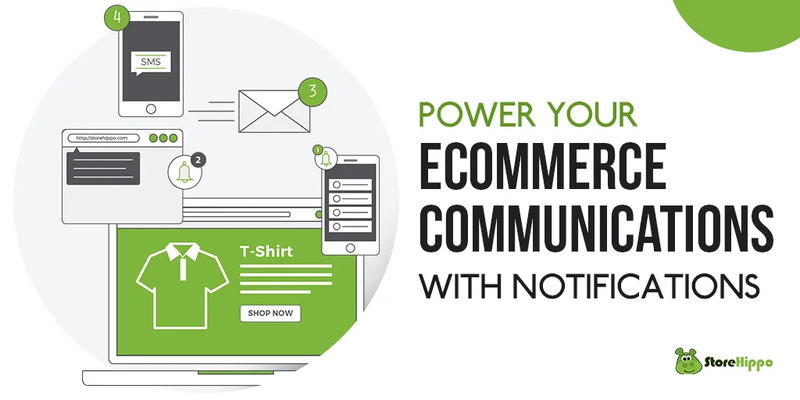 Before we delve deeper on the topic and find out how each of these ecommerce communication channels can be used in the best possible way, let us see the 5 most important benefits of having unified notifications for an online store. Keeping customers informed is essential to lower the rate of customer grievances. Customers usually have fewer complaints if you send out notifications at various stages of receiving, processing, shipping, tracking and delivering an order, and keep them duly informed. Similarly, if there are any delays, it is better to send out emails specifying that there has been some delay and you are taking appropriate measures to minimise the delay. Keeping your customers informed and engaged through multi channel notifications can also help you in getting feedback and suggestions for improving your products and services. Your marketing efforts can pack an extra punch when the customer is targeted using all the means of notifications. Imagine a scenario where you are depending on your marketing only via newsletters. Now compare it to a scenario where you are sending newsletters via email, one time discount codes through SMS and product based discounts and offer notification using mobile and web based ecommerce push notifications. A multi pronged marketing approach always gives a higher ROI and makes marketing effortless. A majority of online purchases are a result of impulse buying. Usually, customers flip through various online shopping websites in their free time and when they come across a product of their choice they go for impulsive buying. You can track customer behaviour and send out special deals and discounts using mobile push notifications which have a 50% higher open rate than emails. Also, mobile notifications have an edge as they have double the clickthrough rate when compared to email notifications. However, if the customer leaves the order process incomplete you can set up an abandoned cart follow up email which stays in their mailbox and reminds them to come back an order later. The ultimate purpose of having notifications enabled on your website is to engage customers in a way that they can be prompted to buy more from you. Having automated notifications help you in achieving this by targeting customers through various channels. To best achieve this you should use multiple notifications including email, SMS, desktop push notifications and mobile notifications. You can segment your customers based on geography, product type, order volume etc. and send unified notifications with a personal touch. This increases the average customer lifetime on your store and helps in increasing long term repeat sales of your website. You can greatly reduce the human effort needed in following up with customers when you enable multi channel notifications on your website. Apart from setting some global notifications for order received, shipped and delivered; you can set up custom notifications that improve customer engagement without human intervention. Some examples of this type of custom notification can be, notification for order refill, order feedback, one time coupon code etc. This approach forms the first line of customer support for your brand and allows the actual support team to take it to next level by more engaging communications at the human level. Notifications make communications with clients easier and faster. They not only keep your customers engaged but also bring back lost sales. When employed in the right combination and frequency they can do wonders for your brand’s performance and sales. StoreHippo top ecommerce platform provides all the above mentioned notifications in its package and helps online sellers to do effortless marketing with higher ROI. Keep watching this space as we would be publishing more articles on the benefits of various notifications and how to use them to derive maximum profit for your business.